The Theropod Database Blog: Is Gualicho Aoniraptor? A very cool theropod was published today- Gualicho shinyae (Apesteguia et al., 2016). It's a large taxon from the Huincul Formation of Argentina, notable for having tiny, didactyl arms and generally resembling Deltadromeus. The authors propose both are related to megaraptorans instead of ceratosaurs... and wait, didn't we just have this situation (Motta et al., 2016)? I might as well be the first person* to propose this seemingly obvious synonymy- Gualicho is the same taxon as the recently named Aoniraptor. 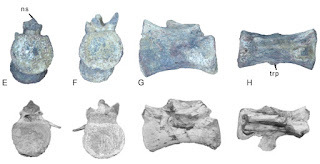 Both are from the same formation, of similar size (mid caudals ~87 vs. 83 mm), and Gualicho has two diagnostic characters noted for Aoniraptor- "anterior mid-caudal vertebrae with fan-shaped prezygapophyses lacking a discernible articular surface for contacting the postzygapophyses; presence of a blunt and thick process on the lateral surface of the prezygapophyses of anterior midcaudal vertebrae", and might have the third- "mid-posterior caudals with a pair of nonarticular flat surfaces located on the posterodorsal corner of the centrum." As Aoniraptor was named first (June 16th vs. July 13th), it has precedent over Gualicho. Edit #2: As Brad McFeeters notes in a comment below, the volume Aoniraptor was named in has yet to be physically published and does not contain a ZooBank registration, thus Gualicho has precedent. I'm skeptical that these and Deltadromeus belong in Tetanurae, as it only takes 4 steps to move them to Ceratosauria in Apesteguia et al. 's version of Carrano's tetanurine analysis, and Deltadromeus wasn't added to their version of Novas' tetanurine analysis which also lacks any ceratosaurs except the outgroup Ceratosaurus. They note "Gualicho does exhibit some apparent ceratosaurian synapomorphies, most notably a robust MT III with posteriorly expanded proximal articulation and a flange-like m. iliofibularis tubercle." It would have been interesting to run them in a ceratosaur analysis. Holotypes of Gualicho shinyae (MPCN PV 0001; top) and Aoniraptor libertatum (MPCA-Pv 804; bottom) in posterior (E), anterior (F), left lateral (G) and dorsal (H) views. Modified from Apesteguia et al. (2016) and Motta et al. (2016). References- Apesteguía, Smith, Juárez Valieri and Makovicky, 2016. An unusual new theropod with a didactyl manus from the Upper Cretaceous of Patagonia, Argentina. PLoS ONE. 11(7), e0157793. Motta, Aranciaga Rolando, Rozadilla, Agnolin, Chimento, Brisson Egli and Novas, 2016. New theropod fauna from the Upper Cretaceous (Huincul Formtation) of northwestern Patagonia, Argentina. In Khosla and Lucas (eds.). Cretaceous period: Biotic diversity and biogeography. New Mexico Museum of Natural History and Science Bulletin. 71, 231-253. If they are synonyms, I think Gualicho may become a nomen protectum; it seems to be getting used a lot more than Aoniraptor, at least as far as Google tells me; as Aoniraptor has about 2,180 results, while Gualicho has about 344,000 results. So technically, shouldn't Gualicho be able to be named a nomen protectum, as it seems to have a lot more recognition then Aoniraptor? Or will this devolve into a Manospondylus/Tyrannosaurus situation? Being the cynic I am regarding the state of nomenclature these days, these kinds of thoughts certainly entered my mind. I don't think it would be fair at all to Motta et al. to make their name a nomen rejectum merely because they lack publicity. Surely that's unscientific, and would require an ICZN petition. The more likely scenario in my mind is that few workers actually acknowledge Aoniraptor, and those that do just brush it off as a nomen dubium without detailed comparison or justification. True, it would require an ICZN petition. And honestly, I'm not keen on that idea, either...but it'd be best to act now so that we won't potentially end up with a similar situation to how, say, "Nanotyrannus" or Manospondylus are currently. Well, Manospondylus is seemingly a nomen oblitum (though it would be interesting to examine just how it fulfills ICZN Article 23.9). Nothing named as valid today can become a nomen oblitum because to qualify, a name must not be "used as a valid name after 1899" (ICZN 23.9.1.1). Thus for Aoniraptor, authors wishing to reject it on nomenclatural grounds would have to follow ICZN Article 23.9.3. Nanotyrannus isn't a similar issue, because that's a scientific dispute over whether one taxon is a juvenile stage of another. Everyone agrees Nanotyrannus is distinct, they just argue whether that distinction is ontogenetic or phylogenetic. The ICZN rightly has no jurisdiction over resolving science-based questions like that. Well, I know that T.rex fufills Article 23.9.1.2, but has anybody used Manospondylus as a valid name since 1989? If so, then we may be at a point where we'll need to just buckle down and get this mess sorted out. That'd likely just result in Mano being surpressed, but a solution is better than ignoring it. For Aoniraptor and Gualicho; that is the best course of operations if we really do need to synonymize those genera. I feel like the latter may take priority, seeing as how it's been recieving more publicity...but who knows? Maybe we'll keep Aoniraptor valid and ditch Gualicho. Gualicho is an already extant word in South American Spanish (also spelled gualichu). That's probably inflating the results. And that's why I put in "Gualicho shinyae" as my search, Pete; to avoid result inflation. The PDF version of the paper naming Aoniraptor does not appear to meet the requirement of ICZN Article 8.5.3 ("Works issued and distributed electronically. To be considered published, a work issued and distributed electronically must be registered in the Official Register of Zoological Nomenclature (ZooBank) (see Article 78.2.4) and contain evidence in the work itself that such registration has occurred. "), while the print edition did not, as of July 13 2016, meet the requirement of Article 8.1.2 ("it must be obtainable, when first issued, free of charge or by purchase"). According to Article 21.9 ("Works issued on paper and electronically. A name or nomenclatural act published in a work issued in both print and electronic editions takes its date of publication from the edition that first fulfilled the criteria of publication of Article 8 and is not excluded by Article 9. "), the print edition will establish the recognized publication date for these taxa when it becomes publicly obtainable. In an e-mail yesterday, one of the editors of the volume (S. G. Lucas) informed me that the print edition had just been shipped from the printer, and will be available for purchase in about two weeks. Gualicho appears to technically have priority over Aoniraptor, no popularity contest necessary. Well, that solves that. Not including a ZooBank registration is just negligent these days. Hopefully Novas, Agnolin and such have learned their lesson from Aoniraptor's fate. Alright then, from now on I guess we can safely lump "Aoniraptor" into Gualicho. Good to see a solution so quickly, though. Will go updating WP appropriately. I really happy to hear that Gualicho have priority over Aoniraptor. I don't particularly like the rule about electronic publication not having priority (though, not putting a ZooBank registration is sort of irresponsible, however), but I'm pretty confused about a few of those rules anyway. But it is what it is, Gualicho shinyae is a cool name at least. Now the thing I'm really confused about is Gualicho's placement within Theropoda (and I suppose Deltadromeus and Bahariasaurus as well). Gualicho and Deltadromeus look superficially like noasaurids to me, but I'm far from an expert on anatomy or phylogeny, so that's just a gut reaction. Time will tell I hope. After reading the paper completely, there are so many times Apesteguia et al. note ceratosaur-like characters in Gualicho, most of which weren't used in the tetanurine-centric analysis of Carrano et al.. I also added both it and Deltadromeus to the Lori analysis as a test, and neither one emerged anywhere by Neovenator or megaraptorans. Hi Mickey, what was then your result of Gualicho and Delta in the Lori analysis? closer to ceratosaurs? The Lori analysis is centered on coelurosaurs, and uses all of the Theropod Working Group characters, so has no characters designed to support Tetanurae, Ceratosauria, Avetheropoda, Orionides, Abelisauroidea, etc.. Gualicho and Deltadromeus emerged together in Ornithomimosauria, BUT so did Elaphrosaurus. Unlike Peters, I'm smart enough to realize this is due to character sampling. The outgroup is currently Cryolophosaurus, and I haven't included any other ceratosaurs. That's OK. Some of them really are confused. Example: Are types specimens or individuals? There are hints and implications, but no clear statement anywhere. Of course most specimens are all we have of exactly one individual; but some aren't. I think I've even found Rules that outright contradict each other. In the present case, though, there's no question: Gualicho is validly published, "Aoniraptor" is not.